Carefully designed nanoparticles, embellished with a variety of molecules to target a specific organ of interest, can be used to transport hydrophobic drugs to a particular site in the body. Here, gold nanoparticles 5 nanometers in size (dark core) that were coated with Epidermal Growth Factor (EGF) peptides (light shell) are loaded with a fluorescent and photodynamic therapy drug called Pc4. 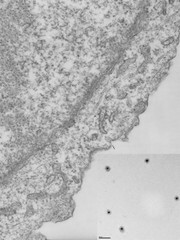 The image shows a nanoparticle arriving to brain glioma tissue (arrow).